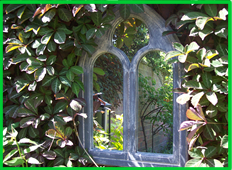 Garden-Mirrors.co.uk specialising in outdoor mirrors. Here at www.garden-mirrors.co.uk, we have over 30 years of specialist knowledge in rigid sheet plastic and all that can be created from it. All of our products are made by our time served craftsmen at our factory in Dorset. We provide both plain and decorative Garden Mirror, long life, vandal proof Dibond, tinted Perspex and Plexiglass sheets, Safety Glazing, DIY Plastics, Retail and Point of Sale Light Boxes, Retail Displays, Boat Windows, Polycarbonate Machine Safety Guards and much more. No matter how big or small, please contact us to discuss your requirements..
We offer a wide range of mirrors in both acrylic and polycarbonate in 3mm or 6mm thickness. Mirrors have been used in outdoor design for over two centuries to create drama and stunning design by leading garden designers. A Garden Mirror is perfect for hanging against the wall, mounting particularly into a hedge, or hanging behind garden trellis or gates to create fabulous illusions. Find out more! 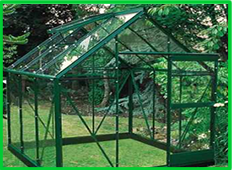 www.garden-mirrors.co.uk offer a wide range of rigid sheet products for replacement safety glazing in greenhouses, sheds, children’s play houses, play schools and nursery’s. Quality is offered at an exceptional price with UK distribution. We can cut to all sizes and requirements. 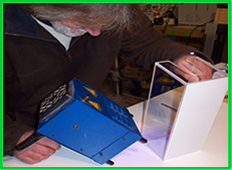 We also offer a range of tinted acrylic and textured/sandblasted acrylic for special effects. Find out more! We take pride in selecting materials and fabricating to your requirements. Here we can undertake custom fabrication; balcony screens, boat windows, machine safety guards, light boxes, custom made display cases and many more! We have over 20 years experience of working with Perspex, Plexiglas, and Altuglas and can offer you with a truly bespoke fabrication service... Find out more! www.garden-mirrors.co.uk supply acrylic garden mirror, alibond garden mirror, illusion garden mirrors, open shutter garden mirrors, slate garden mirrors, love heart garden mirrors, bow top filigree garden mirrors, garden mirrors with planters, tudor wooden garden mirrors, gothic garden mirrors, resin stone garden mirrors, childrens frog and butterfly indoor / outdoor mirrors, moorish garden mirrors, lattice garden mirrors and custom made garden mirrors. Please click on the images for further details. Home | Bespoke Serivce | Garden Mirrors | Contact Us Copyright © 2009 Garden-Mirrors, All Rights Reserved.